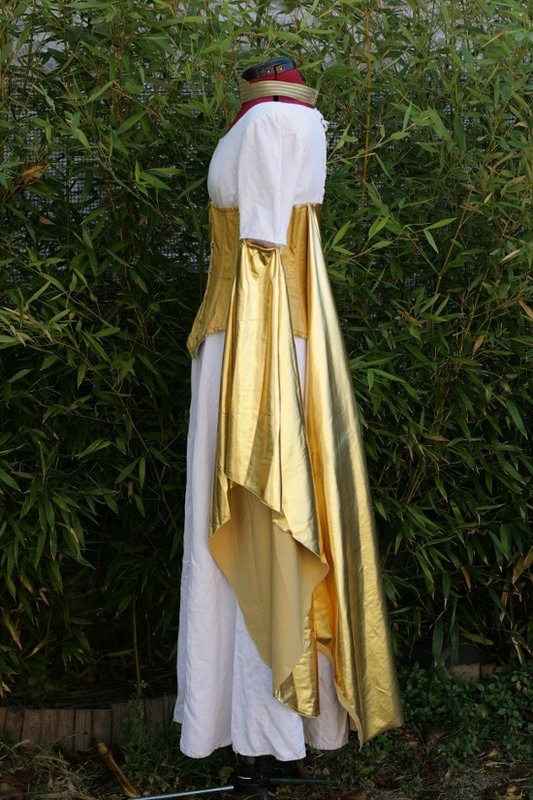 Here are pics of my “grand Theogonist of Arianka” costume. 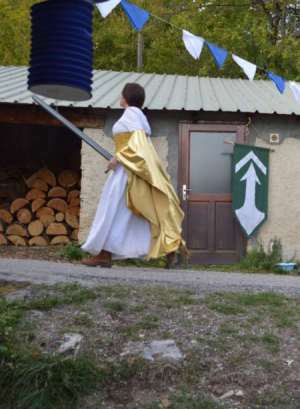 It’s a character I played during my last Warhammer LARP. It’s an authority figure with precepts like : order, discipline and unity. Those of you who know the Warhammer universe know that the Grand Theogonist represents the cult of Sigmar, but we were in a parallel universe where Arianka is the main Goddess in the Empire. 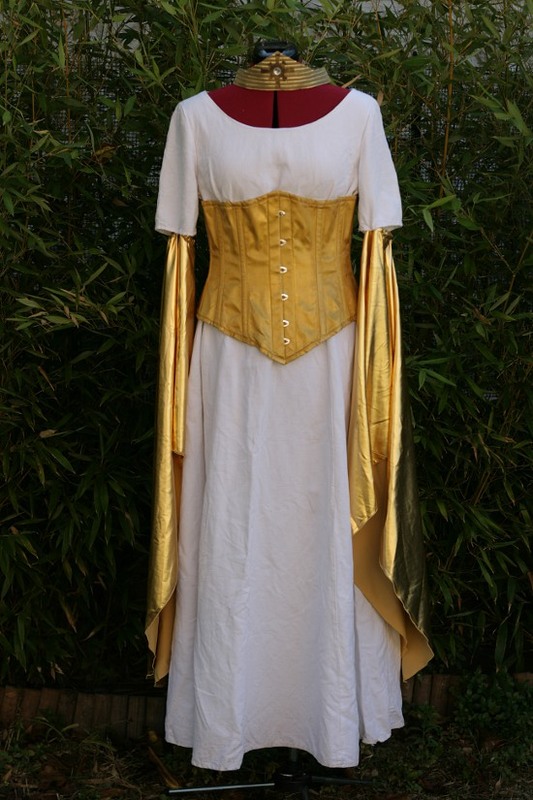 As a base, I used my white medieval style dress to which I added large sleeves, a corset, a train and a headband / tiara… All of this, brace yourself,… In a golden color ! I used McCall’s 4491’s large lower sleeve pattern. I elasticized the upper edge to be able to change them quickly. To get clean edges, I did a rolled hem with my the serger. No, I did not make the corset! No time! And I don’t know how to make one to begin with, do learning as the same time would have taken me even more of a time I did not have! But a golden corset is tough to find. 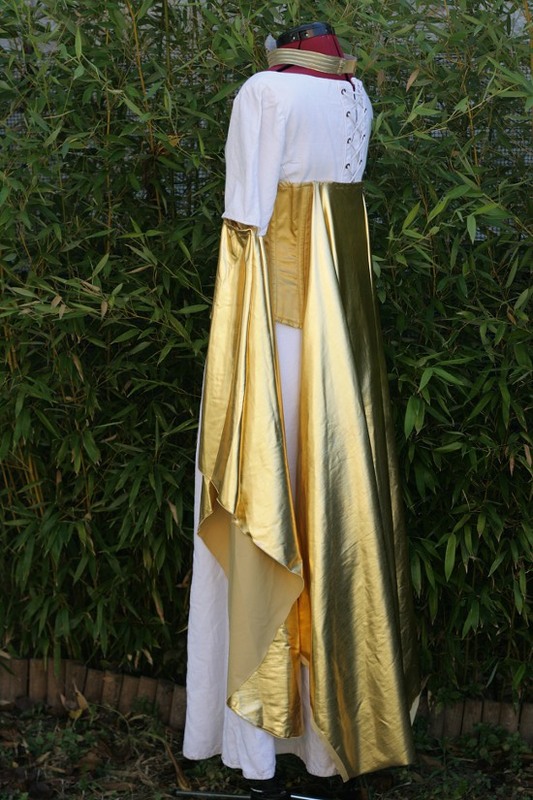 That’s why I bought a white corset that I simply painted with a gold acrylic paint purchased in an art store (regular paint, not fabric paint). Because this corset will always be dry cleaned, the acrylic paint shouldn’t be an issue. I painted two layers. The end result isn’t too bad. I thought, for a moment, about adding embellishments to the corset but I finally opted for simplicity (as I do most of the time in my sewing projects), especially since the character is pretty uptight : frills aren’t her thing. For the train : I made it directly on the dress form. 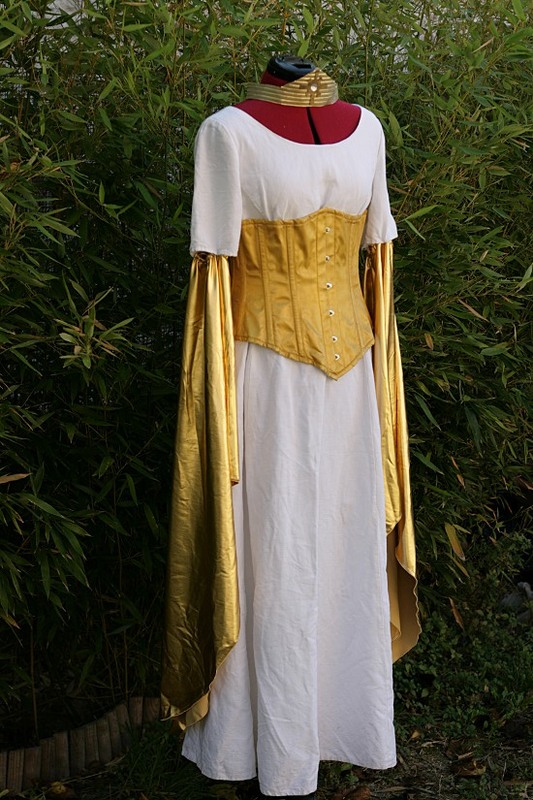 I just hung the golden fabric at the upper edge of the corset back, where I hand-stitched it, and then cut the train until it looked like what I wanted. I used the same stretch fabric as the sleeves and didn’t hem it (the fabric doesn’t fray). I used a faux leather as the base (but it can’t be seen in the end result anymore) in which I cut the shape of the headband. I then stitched lengths of golden ribbons over it. Finally I glued the symbol of Arianka. The symbol was cut out of faux leather and painted gold (with fingers oO). At the center of the symbol a big strass is superglued. 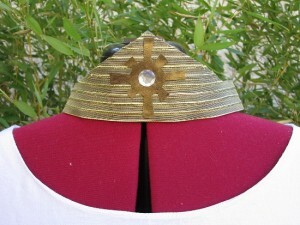 To form the headband and for it to fit snugly around the head, I sewed the two ends to a piece of wide elastic (2.5-3cm), also painted gold. The elastic being hidden under the hair once the headband is in place. Add to that a two-handed sword (thanks Jean !) 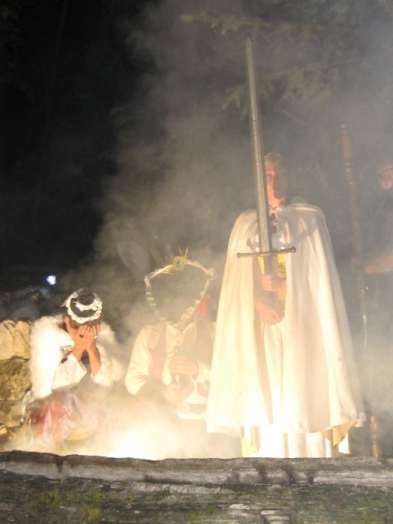 and I was the leaving image of authority… What do you mean it’s all because of the sword ? Going somewhere and meaning it ! 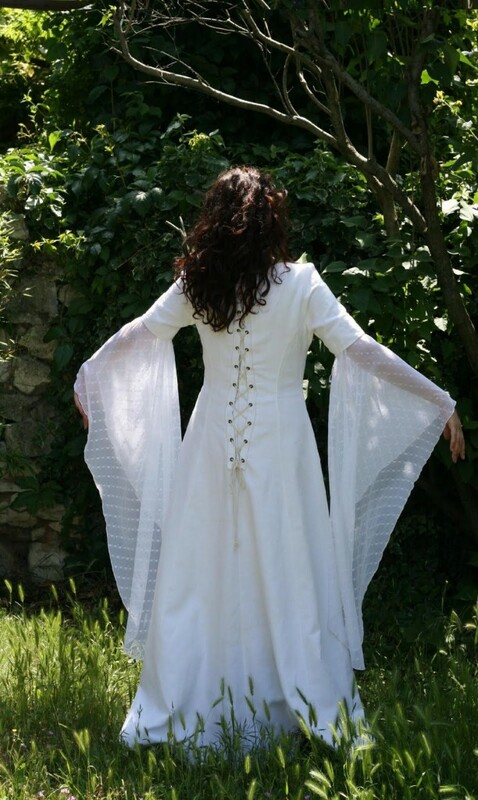 This entry was posted in Blog, Costumes, Sewing Projects and tagged Costumes larp, McCall's by Véro. Bookmark the permalink.